La Villa is a 5 minute drive from the sea, from the historical centre of town and from a small shopping centre. For our summer guests who decide to visit the surrounding areas (Taormina, Castelmola, Letojanni, Mt. Etna, le Gole dell’ Alcantara, Isolla Bella) we suggest they rent a car or a scooter. It is a 10 minute walk to the bus-stop. 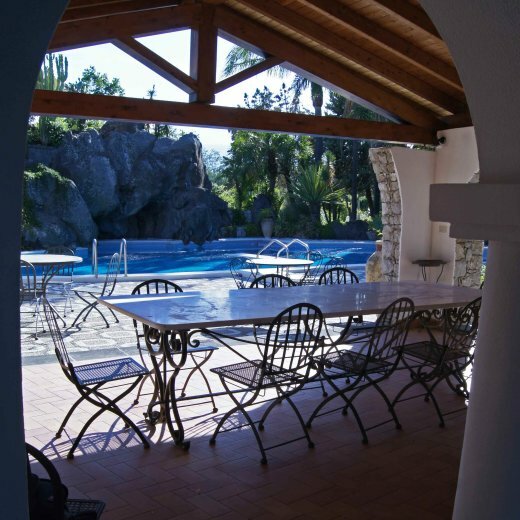 We live at La Villa and we share with guests our two kitchens (one is outside in the pool area for summer use and one is inside basically for autumn/winter use), bbq, swimming pool area includind the patio and living rooms. En-suite bathroom (25sq m.) with shower, adjustable air-conditioning, maxi-screen satellite tv Surrounded by greenery, patio overlooks the swimming pool. Private entrance. 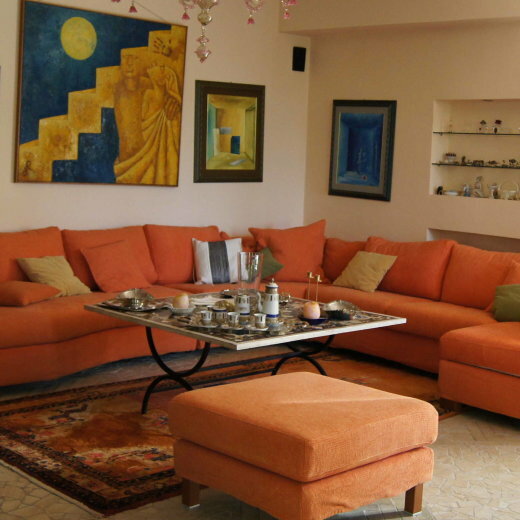 These two comfortable rooms, furnished in a modern style, can accommodate a maximum of 5 guests. The double room has a double bed and a single bed that can be converted to a double one, adjustable air-conditioning, satellite tv, desk, bookshelves, terrace, own entrance. A spacious bathroom with bath, shower & double wash-basin. Small private sitting- room. La Villa is a 5 minute drive from the sea, from the historical centre of town and from a small shopping centre. It is a 10 minute walk to the bus-stop. For our summer guests who decide to visit the surrounding areas we suggest they rent a car or a scooter. 5 min to Giardini Naxos seafront from where you can admire the splendid view across the bay while enjoying excellent seafood in one of the many restaurants. 10 minute drive to Taormina. Visit the Greek theatre, the Naumachie, the communal gardens (villa) and admire the breathtaking view from Piazza IX Aprile. Stroll along the fashionable Corso Umberto. Stop to sip an aperitif at one of the local bars or restaurants to be discovered if you wander up or down the steps of the narrow side-streets. After dinner the evening continues at Taormina’s renowned night-clubs. 10 minute drive to Isola Bella, “Pearl of the Mediterranean”, a tiny island situated between the bay of Mazzarò and Cape Taormina. It’s connected to the shore by a tongue of land which disappears at high-tide. 20 minute drive up to Castelmola, the medieval town above Taormina, where you can sample its famous almond wine. 20 minute drive to le Gole dell’ Alcantara. A spectacular destination for nature-lovers. Over the course of thousands of years the Alcantara river has eroded the ancient lava-flows, which once dominated the area, forming deep ravines and gorges. You can wade along the crystal-clear river for about 200 m; gazing up at the walls of the gorges, 25 m. high in places.